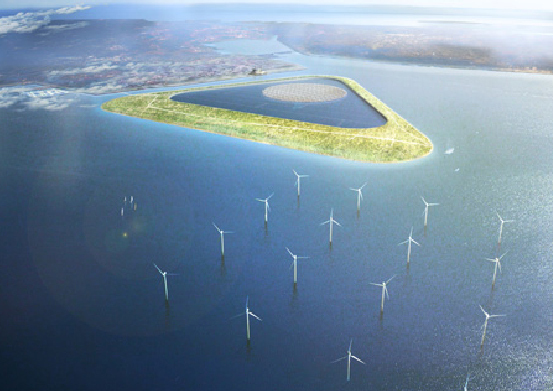 The proposed Green Power Island off the coast of Copenhagen seeks to be an alternative energy super center for the country. Designed by Gottlieb Paludan, the massive man-made island will utilize wind power, solar power, seawater pumps, and produce marine biomass for biofuel. Improving on the pumped hydro-renewable energy concept, Green Power Island could become Copenhagen’s alternative energy center, providing energy for all of the country’s residents around the clock. Wind power is an incredible resource, but when the wind doesn’t blow, neither do the turbines. The design solution integrates a combination of alternative energy collectors, as well as pumped hydro. The system, which is based off the energy of water being pumped from two reservoirs of varying heights has been adapted for the island. Rather than building two reservoir tanks, Paludan proposes a lagoon within the island. During low wind weather, the surrounding seawater is pumped into the inner island lagoon, turning turbines that generate power. The lagoon will be allowed to drain when wind power hits its peak. This system utilizes the existing sea, and therefore requires only one “tank” to be built. Covering almost three square miles, the island will be linked with the Avedore Power Plant, another man-made island. A crop of algae will be raised for each biofuel, its carbon dioxide cleansing properties and food. Additionally, a solar power station will call the island home — the biggest in Scandinavia if the project is built. The incredible blueprint for the Green Power Island has also been proposed for Bahrain, Jiangsu and Tampa, Florida. This a a very interesting and ambitious project.Part of the description is, however, obviously wrong. Surely it is at times of high wind velocity or low demand that spare power is used to pump seawater uphill. When wind velocity is low (or demand high) that water can flow down again, through the turbines. This sounds like a great solution. I wonder about the effects that it may have on sea life? Very Ambitious. It brings together a combination of alternative energy technologies, but do they have the will and finances to accomplish it? 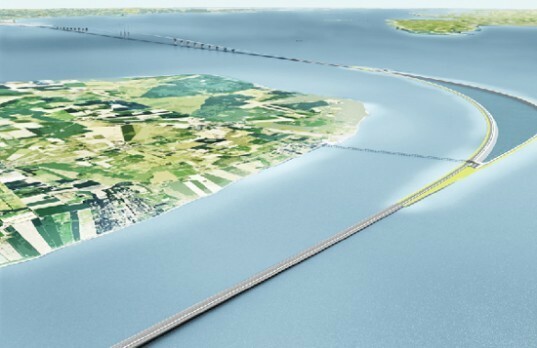 The proposed Green Power Island off the coast of Copenhagen seeks to be an alternative energy super center for the country. Designed by Gottlieb Paludan, the massive man-made island will utilize wind power, solar power, seawater pumps, and produce marine biomass for biofuel. Improving on the pumped hydro-renewable energy concept, Green Power Island could become Copenhagen's alternative energy center, providing energy for all of the country's residents around the clock.